Purbanchal University has started Bachelor in Food Technology (B. Tech. Food) for the first time in Nepal. The courses is designed to fulfill the needs of high level, competent, practical-oriented food technologists in the country. 1. 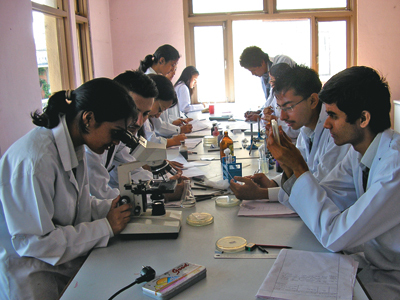 To provide the students with theoretical as well as practical knowledge of general chemistry, food chemistry, biochemistry, food process engineering, product specific technologies, food processing and preservation methodologies, aspects of hygiene, nutrition, quality control and analysis of modern and indigenous food products and food plant management. 2. To provide students with the knowledge of modern management systems, i.e. TQM, GMP, HACCP as applied in modern food and dairy industries and research methodology. 3. To provide actual field experience and on-the-job training or in-plant training experiences to make the students perfect and practically fit for adjustment in the food industries, government and other jobs. Candidates who have passed I. Sc., +2 Science, diploma in food and dairy technology from an institution duly recognized by PU shall be eligible to apply for admission to the course. Applicants seeking admission needs to appear compulsory at the entrance examination of two hours in Physics, Chemistry, Mathematics and English subjects ; selection for the admission will be made entirely on the basis of merit. 1. Bachelor in Food Technology (B. Tech. Food) will be of eight semesters equivalent to 4 academic years. 2. One (1) credit (theory or practical) allocates 15 lecture hours. Each credit holds a score of 25 marks. 3. Students will be encouraged to visit the food and dairy industries and research laboratories from time to time. 4. Students have to compulsorily participate in the in-plant training for one and a half months (45 days) in the food/dairy industries and other related institutions. 5. Students must compulsorily complete research based (laboratory work based) thesis or dissertation in the eighth (8th) semester. Students will have to appear at the theory and practical examinations at the end of each semester. The time given for the theory examination will be based on credit hours allotted to the theory course as follows: 1 hour for 1 credit courses, 2 hours for 2 credit courses and 3 hours for 3 credit courses. The practical examinations shall be of 6 hours. For subjects the practical examinations of which require more than a day the same 6 hours must be divided among the practical, viva voce and observation exams. Evaluation of students during in-plant training and observation tours will be based on students’ performance, report submission and interview by the supervisor. Twenty percent (20%) of the marks allotted to the theory courses in each subject is allocated to the internal assessment to be conducted by the college fulfilling the rules and regulations of PU whereas 80% marks will allotted to the final examinations conducted by the university at the end of each semester. A research based dissertation work must be carried out by the student in the eighth (8th) semester. The printed report must be submitted in a specific format to the college. The student has to present and defend his/her research work to the dissertation committee consisting of department head, two internal examiners assigned by the college, an external examiner assigned by the university and the dissertation supervisor. The total number of credits of the Bachelor in Food Technology is 135 i.e. 88 credits for theory and 47 credits for practical. The total marks is 3375 i.e. 2200 marks for theory and 1175 marks for practical. c. Students must pass theory and practical examinations separately. The courses during Semester One (1) to Semester FOUR (4) are common to both Bachelor’s in Food Technology (B. Tech. Food) and Bachelor’s Degree in Dairy Technology (B. Tech. Dairy).